about 14 or so years ago i read abbas child by brennan manning for the first time. if you see my copy, you will notice that practically the entire book is underlined! when i cracked the book for the first time it touched a place in my heart that needed touching about God’s unconditional love for me. it reminded me how sounds-good-but-there’s-a-different-story-going-on-inside-spirituality & hyper put-togetherness was a waste of time; it became clear that my false self needed to hit the road so i could begin to experience real freedom. since then, i think i’ve read every brennan manning book written. 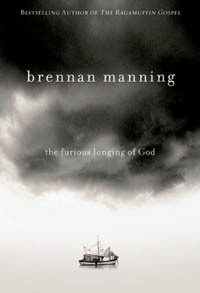 his newest one, the furious longing of God, was a great reminder why every so often i just need a little brennan manning fix. i read it as part of the ooze’s viral blogging book review gig & i’m really glad i did. it was a quick read and really a compilation of many stories he has already shared in his other material, all focused on the critical premise–God loves you and has a furious longing for you that is wild, unstoppable, and far more simple than we’ve been lead to believe. there are great questions at the end of each section that are rich, deep, and would be great to reflect on and share together in some kind of a group setting. i always appreciate how brennan manning helps smash down our distorted images of God that keep us stuck & sad & spiritually lonely. “healing becomes the opportunity to pass of to another human being what i have received from the Lord Jesus; namely his unconditional acceptance of me as i am, not as i should be.” (p. 82). which of these strike you? the furious longing of God infused my soul with a little fuel for the journey; it was a reminder of God’s fierce love not just for me but for all people. great timing on some good stuff. ps: next up on the carnival–out of the darkness: hope & healing from sexual addiction. Dad, must speaking to the same thing to many of us this week. This is very much like what I posted on blog. I too love Brennan Manning. Matter of fact I have only read one or too of his books, but I read a book that a friend of mine sent me 2 weeks ago and when I read Brennan’s endorsement on the back I new I had to read it right away and it was so good I ended up reading it in two day and I’m a slow reader an average reader could probably finish it in a few hours. Dad has been using it to rock my world since. That book is very much on this same topic and is partially what inspired what I wrote. Dad’s love is so fierce that it ravages the darkness within us and sets us free.